"The Ties that Bind: Ancient Maya Textiles and the Modern Tradition," by Dorie Reents-Budet, Ph.D. Figure 1. 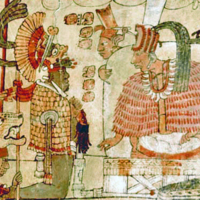 Maya ruler K’inich Lamaw Ek’ receives tribute from subject lords on December 16, 778. Each participant wears formal clothing appropriate to his position and the palace setting, the ruler being the most opulently attired. Museum of Fine Arts, Boston, Loan of Landon T. Clay. Photo © Museum of Fine Arts, Boston. Dressing the human body for protection from the elements has been a constant need since the early beginnings of humanity more than 100,000 years ago. But the body’s basic necessities of defense and comfort cannot begin to explain the marvelous elaboration of clothing and the textile arts the world over and throughout time (fig. 1). From the earliest eras, clothing and body adornment rapidly became a prime social medium for expressing relationships between the wearer and society at large, a practice which remains strong in the modern world. For example, textiles and accouterments denote one’s communal identity, social and economic status, and political and spiritual beliefs, thereby simultaneously expressing unity and personal individuality. Therefore once the essential need to protect the body was realized, cultures throughout the world expanded clothing and body adornments into an effective tool for communication. Figure 2. 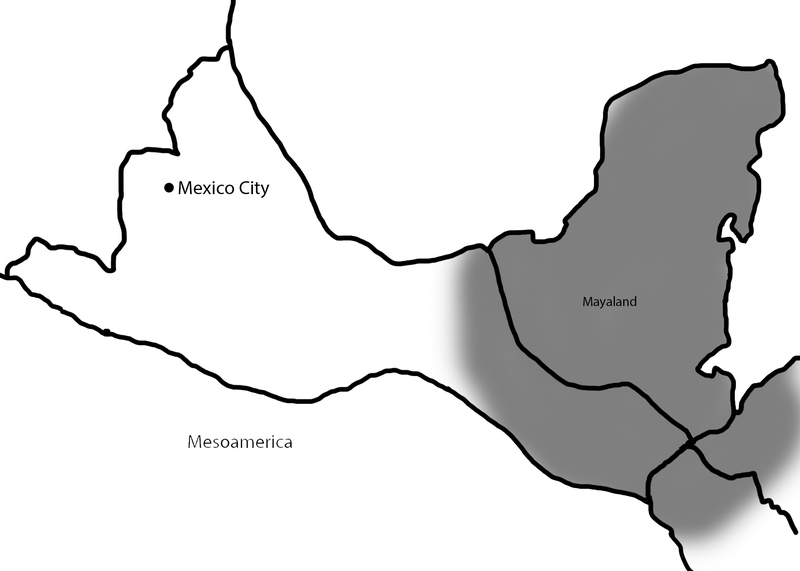 Map indicating the location of the ancient and modern Maya within Mesoamerica. Drawing by Georgia Clark. The social role of clothing was well developed among the myriad cultures of Mesoamerica that were encountered by the colonizing Spanish in the 16th century (Anawalt 1981). From Mexico to Honduras, clothing styles identified a person’s geo-cultural origin and even specific community, serving as the visible foundation of political identity and place within her/his culture’s concept of social and universal order. Therefore, the study of dress in ancient Mesoamerica encompasses the many facets of society and political organization throughout this vast region, in which the Maya inhabit its southeastern half (fig. 2). Figure 3a. A fragment of brocade cloth from the Sacred Cenote, Chichén Itzá, Mexico. Photo courtesy of Peabody Museum of Archaeology and Ethnology at Harvard University. Yet data concerning ancient clothing styles are limited because so few fiber remains have been recovered from the archaeological record, the only survivals being cloth fragments or “pseudomorphs” (decayed fibers substituted by a mineral compound) (fig. 26b) (see The Threads of Time Conservation Project). The lack of surviving Maya textiles is largely due to the region’s wet environmental conditions that preclude the survival of organic materials, which is in sharp contrast to the arid climes of the Andean world where spectacular textiles have survived from as early as 2400 BC (Murra 1989, Paul 1991; also see Cobo 1990 , Guaman Poma 1980 ). Given the paucity of surviving ancient Maya cloth, we look to carved stone monuments and especially painted pictorial ceramics to glimpse the textile arts from the Classic period (figs. 7, 13-19, 20b-23, 25, 26a, 26c-29. Figurines also are a bountiful source of textile depictions but are beyond the scope of this study (e.g. see Schele 1997) (fig. 20a). A few examples of pre-Hispanic Maya textiles have survived and provide important examples for comparison to the carved and painted depictions of textiles. The largest fragments come from the bottom of the Sacred Cenote at Chichén Itzá, its nearly anaerobic conditions preserving the organic fibers (figure 3a). Smaller remains have been excavated from burials at sites in Belize, Guatemala, and Honduras, although these examples are but miniscule remains of stacks of fabric offerings or the wrappings of special objects (fig. 3b) (also see Carlsen 1986, King 1979, Mahler 1965, Mastache 1971, Plitnikas 2002, Johnson W. 1954). Yet these tiny fragments exemplify the expertise of ancient Maya weavers even though they comprise a limited corpus of the wide-ranging technical repertoire available to Classic period weavers (Coggins and Shane 1984, Lothrop 1992). Figure 3b. Eccentric flint with textile remains; from a dedicatory offering inside Structure 16 (the “Rosalila” shrine), Copán, Honduras. Photo courtesy of Ricardo Agurcia. Figure 4. Diego de Landa Calderón (1524-1579), the first bishop of Yucatan, Mexico, wrote detailed accounts of all aspects of Maya life during his residency in the Franciscan mission of San Antonio in Izamal from 1549-1566. Sixteenth-century portrait in a monastery at Izamal, Mexico (artist unknown). Licensed under Public Domain. Albeit small, the surviving Classic period remains reveal the presence of both Z-spun and S-plied cotton yarn, at least three types of plain weaves, brocades (plain weaves with supplementary weft decoration), twills, double cloth, gauze weaves, looped weft pile, tapestry, and warp-float and open work with supplementary warp weft floats (Looper 2007, 85). Impressions on the bottom of pottery vessels excavated at sites throughout the Maya region provide additional evidence for plain, duck and canvas weaves (e.g. at Piedras Negras and Uaxactun; Kidder 1947, 70). These impressed remains intimate the usefulness of fabric for pottery-making, a practice which continues uninterrupted among present day potters in Yucatán and Guatemala (Reina and Hill 1978, 135-136). Figure 5. 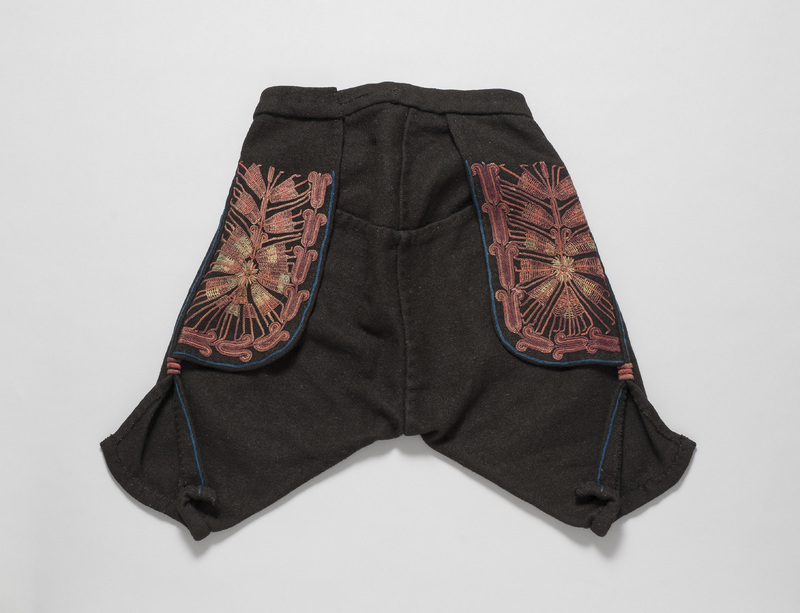 A pair of Maya men’s pants from the town of Chichicastenango show the strong influence of Spanish clothing. Michael C. Carlos Museum, 2009.42.96. Photo by Michael McKelvey, 2017. Before turning to the ceramic depictions, another significant source is Colonial-period writings by Spanish and indigenous authors that illuminate the pre-Hispanic Mesoamerican traditions (Acuña 1984, Motolinía 1971, Oviedo y Valdez 1851-5 , Sahagún 1950-82). Among the most detailed writings are those of 16th-century chroniclers Bartolomé de Las Casas (1951, 1967), Diego López de Cogolludo (2010), Bishop Diego de Landa (Tozzer 1941) (fig. 4), and a plethora of Crónicas written by different authors, including those living among the Maya in the Guatemalan highlands (Recinos, Conoy and Goetz 1950; also see Christenson 2001 for an in-depth list). 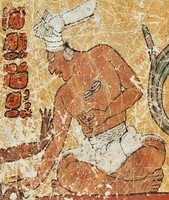 Diego de Landa’s tome Relación de las Cosas de Yucatán (Account of the Things of Yucatan), written around 1566 and first published in 1864 by Abbé Brasseur de Bourbourg, offers primary information concerning nearly every aspect of the social life of the Yucatek Maya of eastern Mexico. Bishop Landa worked closely with Native individuals including Juan (Nachi) Cocom and Gaspar Chi who came from well-placed families, and he borrowed heavily from other chroniclers’ writings (Tozzer 1941, viii-ix). Throughout the manuscript Landa describes the importance of textiles for communicating social identity, religious roles and ritual practices, and for transacting economic affairs. He focuses on cotton cloth as a primary exchange commodity and means to settle debts and pay taxes. Landa also describes the principal kinds of garments worn by the Maya, defining who wore which type and when. We can compare these descriptions of textiles and related customs with the ancient survivals to glimpse the now-lost social and economic practices, symbolic meanings, and artistic expressions in the fiber arts. Figure 6a. 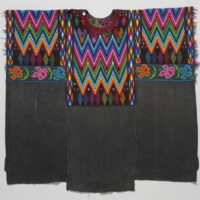 A contemporary woman’s blouse from Santiago Atitlan (a Tz’utujil town). On loan to the Michael C. Carlos Museum, L2016.27.2. Photo by Michael McKelvey, 2017. Figure 6b. Huipíl from Santo Tomás Chichicastenango (a K’iche’ town), ca. 1945. Michael C. Carlos Museum, 2016.18.1. Photo by Michael McKelvey, 2017. We also look to modern forms of dress for continuities with the past (e.g. Carlsen 1991, Morris 1985a, Johnson W. 1958). Today, Maya peoples inhabit the eastern half of Mexico, Belize, Guatemala, and northern Honduras (fig. 2). They speak twenty-eight languages and dialects, which linguists divide into the highland and lowland language families (Boas 1911, Longacre 1967). Just as language and social customs distinguish one group from another, so too do manners of clothing the body and the designs adorning the cloth. They comprise the outward expression of each Maya group’s efforts to sustain its distinctiveness within the modern socio-political boundaries and the broader human community. Figure 7. A marriage negotiation takes place inside a palace, with representatives from the potential groom’s family presenting a bundle of valuable goods (e.g. cacao beans) to a seated nobleman who may be the father of the prospective bride kneeling behind him. On loan to the Michael C. Carlos Museum, L2003.14.58. Photo by Bruce M. White, 2011. European clothing styles made lasting changes in Maya garment traditions, especially among the male population because men have long interacted more closely with the colonizing Europeans and post-Colonial administrative structures as they seek credence and employment in the new political and economic systems. In these extra-community positions, indigenous dress was discouraged if not outright banned, and over the centuries Maya male dress was replaced by European forms such as pants replacing the loin cloth and hip wrap attire of Classic Maya men (fig. 5). Indigenous styles of men’s clothing remained in use only in isolated areas and during local rites and social practices. 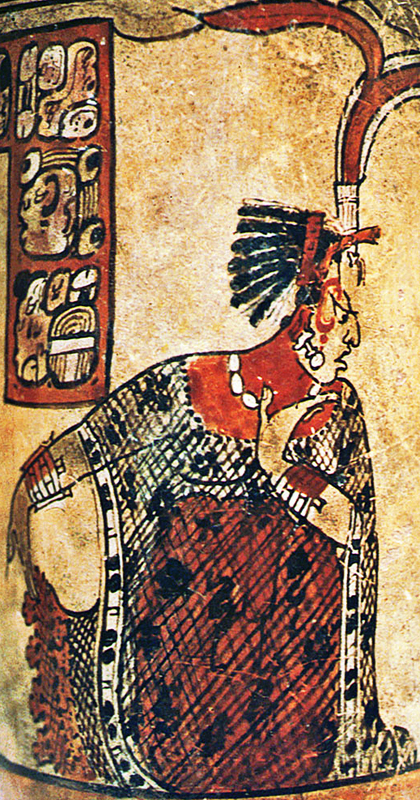 In contrast, Maya women’s attire remained more constant in its Native forms, although it, too, responded to European tenets of appropriateness and style (see Creations of the Red Goddess). Figure 8. Folded in half, a modern Maya man’s blanket is worn draped over one shoulder, its lack of tailoring a continuity with ancient wear. Michael C. Carlos Museum, 2009.42.121. Photo by Michael McKelvey, 2017. Today, the greatest variety of indigenous Maya dress has survived in the highlands of southern Guatemala for a variety of reasons. First, the 16th-century Spanish were obligated to give certain rights and legal status to Native rulers and their constituent communities, and forms of dress were essential markers of identity not only for the Maya but also the Spanish as expressions of the new socio-political order. This is not to say that the Spanish granted free rein for the wearing of Native attire; indeed, European prejudice and restrictions placed constant pressure on the Maya to adopt the foreign norms. Yet Maya clothing styles tenaciously persisted, especially among communities with limited European contact. During the 19th- and early 20th-century struggles for Guatemalan independence from Spain, and later during the devastating 1960-1996 civil war, indigenous clothing styles were crucial statements of Native rights and solidarity in spite of retribution from governmental authorities. Even under these dire circumstances Maya clothing styles survived, and today women throughout Guatemala wear with pride their distinctive local styles of dress (fig. 6). In addition, indigenous garments are commonly worn by Guatemalans of European descent as a statement of national pride. Figure 9. A contemporary Chimaltenango huipíl corresponds to the ancient clothing category of a slip-on blouse. Michael C. Carlos Museum, 2016.18.2. Photo by Michael McKelvey, 2017. This catalog displays the variety and artistry of the modern survivals of ancient Maya dress. They illustrate the diversity of local styles expressed in the artists’ choices of fibers, dye colors, fabric texture, decorative patterns, types of attire and manner of wearing them. Of particular importance, both today and likely in ancient times, was a garment’s decorative configuration. Studies of modern Maya clothing emphasize the significance of textile decoration, which goes far beyond exhibiting the fiber artist’s dexterity and creativity. These intricate tableaux comprise a symbolic system of meaningful visual codes that communicate social and political information and spiritual beliefs (Morris 1985b). They converse on a variety of levels, and the ability to “read” the full message depends on one’s degree of literacy, which is directly correlated with the person’s extent of cultural initiation. As outsiders to contemporary Maya cultures, we can take part in only some of the messages. Others are meant only for members of the immediate community and sometimes only for the weaver herself whose fiber creations are an essential outlet of personal expression and a shielded tool of cultural survival. Figure 10. A man’s jacket from Chichicastenango is tailored in the European style. Michael C. Carlos Museum, 2009.42.93. Photo by Michael McKelvey, 2017. See figure 5 for the matching pants. In Guatemala today styles of dress and decorative programs articulate not only socio-cultural identity but also such features as social status, political affiliation and religious beliefs — both Catholic and indigenous (see Dressing the Saints). The variations in color and decorative imagery differentiate towns and municipios (an organizational system of socio-politically aligned villages imposed by the 16th-century Spanish to manage the Native population for purposes of compulsory labor, tax obligations, and religious conversion). Today, subtle nuances in decorative patterning characterize neighborhoods (barrios), families, and even master weavers. In addition, both coloration and design motifs can communicate such important matters as marital status. For example, widows wear darker colors and avoid the use of red, in contrast to the clothes of unmarried girls who don more fancy and colorful garments. The elaboration and finesse of a young woman’s clothing signify her personal pride and hard-working nature, which indicate she will be a good spouse. Figure 11. A modern Maya backstrap loom is almost exactly the same as its ancient counterpart. Michael C. Carlos Museum, 2009.42.547. Photo by Michael McKelvey, 2017. As for clothing types, as seen the world over, special garments are made and worn during primary life-changing events — especially marriage and religious observances. Ceremonial textiles are profusely decorated with imagery that pertains to the nature of the ceremony and the wearer’s role therein. Maya ritual clothing typically is made of richer materials and displays the highest quality artistry, reflecting the importance of the solemn rites. 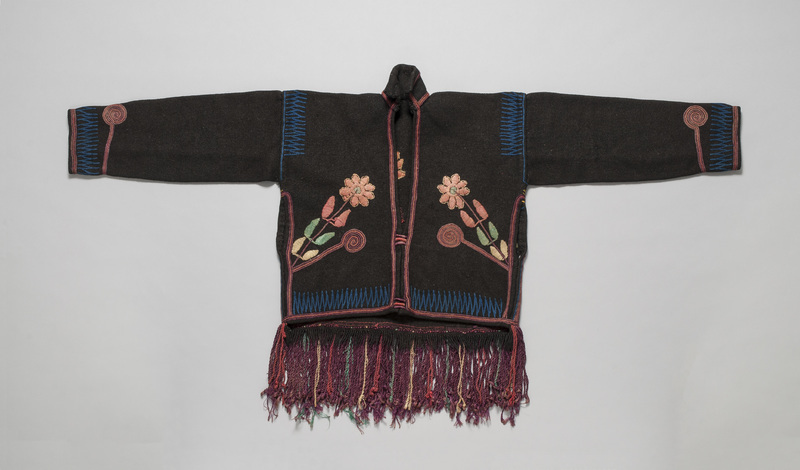 These garments’ decorative programs often are more conservative in design and symbolic content because they convey key religious principles, many of which weave together Catholic and indigenous beliefs. Figure 12. An ancient Mixtec carved bone batten was carved with an elaborate scene of a man’s death, showing that the idea of a simple tool was transcended by these later neighbors of the Maya. Michael C. Carlos Museum, 1994.18.13. Photo by Michael McKelvey. 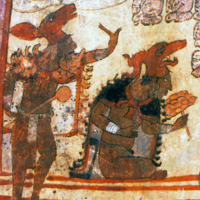 Lacking the actual ancient garments themselves, a primary source of comparative material is the scenes painted on the pictorial pottery, which is a hallmark of Classic Maya culture (Reents-Budet et al. 1994). The painted scenes comprise first-hand, albeit highly formalized, representations of courtly life and ritual (e.g. figs. 1, 7). Men and women are depicted in a variety of official events, including palace-based meetings for social and political proceedings, religious obligations of rulers, war victory celebrations and the presentation of tribute, and royal performances in both public and more private settings (Miller and Martin 2004; Reents-Budet 2001). These renderings offer a detailed inventory of event- and role-appropriate elite clothing, identifying the person’s gender, social status, and political role or civic function (Carlson 1991; Looper 2001; Morris 1985a, 1985b; Reents-Budet 2007; Tate 1992, 70-84). Many of these same garments are described in the Colonial period sources and continue to be worn today, whereas others have dropped out of fashion due to social, economic, and political pressures during Colonial to modern times as discussed previously. Figure 14a. Ruler Ch’ok Wayis wears a plain white loincloth, hip wrap and matching head wrap. Museum of Fine Arts, Boston, Gift of Landon T. Clay, 2004.2204. Photo © Museum of Fine Arts, Boston. Figure 14b. On the same vessel, a courtier standing behind ruler Ch’ok Wayis sports a decorated loincloth with matching hip cloth and head wrap. Museum of Fine Arts, Boston, Gift of Landon T. Clay, 2004.2204. Photo © Museum of Fine Arts, Boston. All ancient Mesoamerican cultures shared a common repertoire of clothing forms based on the same methods of construction. Following the principles of categorization developed by François Boucher and adapted to Mesoamerican traditions by Patricia Anawalt (1981, 9-10), Mesoamerican clothing may be divided into five types. These are the draped garment (fig. 8), the slip-on garment with a neck opening and no underarm seam or split (fig. 9), the open-sewn garment composed of multiple widths sewn together and open at the front, the closed-sewn garment (see fig. 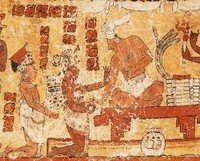 6a), and the limb-encasing garment which is the only Mesoamerican garment that requires both cutting and sewing of the woven textile panel (fig. 10). 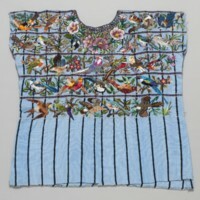 Although Mesoamerican garments may be viewed as simplistically constructed following a limited repertoire of forms, textiles were extensively and expertly decorated using a wide variety of weaving and post-weaving techniques, the latter including painting, dyeing, and embroidery. Color was critically important for both symbolic and aesthetic reasons. Dyestuffs were made from different vegetal sources including flowers, roots, wood bark, and fruit. Other hues were fabricated from marine shellfish dyes, the dried bodies of the female cochineal insect (see The Best of the Best), and various minerals and colored earths. Color also was added to textiles by interweaving or attaching bird feathers; in ancient times, iridescent insect carcasses and colorful shell and stone embellishments were used, too (e.g. Reents-Budet 2009, 43-44, Schvell 1993, 189). Cloth was, as it is today, hand-woven on a backstrap loom (the same type as used in the Andes, see The Best of the Best and Capturing the Rainbow) (fig. 11). The threads were painstakingly processed and spun from cotton, agave, and other plant fibers. The weaving tool repertoire is illustrated and discussed by Father Bernabé de Sahagún in his exhaustive 16th-century report on the lifeways of central Mexican peoples (Sahagún 1926, libro 8, also see Sahagún 1950-82). He describes the fiber arts as the foremost work of women who learn the craft at a very early age and weave throughout their lives. Figure 15a. 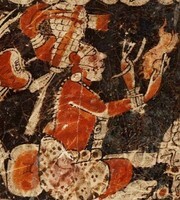 Warriors wearing short-sleeved tunics take captives during a battle, this unusual garment only seen in battle attire in the Classic Maya pictorial record. Photo © Justin Kerr, K2352. Figure 15b. Ritual combatants dress in matching black sleeved tunic and shorts. Museum of Fine Arts, Boston, Gift of Landon T. Clay, 1988.1274. Photo © Museum of Fine Arts, Boston. Sahagún specifically comments that among the Mixtecs of Oaxaca, textiles were so important to the social economy that rulers often had as many as fifteen wives who spent their days constructing fabric and clothing (Burgoa 1989, Herrera 1945, Pohl 1994). Infant girls were presented with all the necessary tools (a very fancy and high-status example seen in fig. 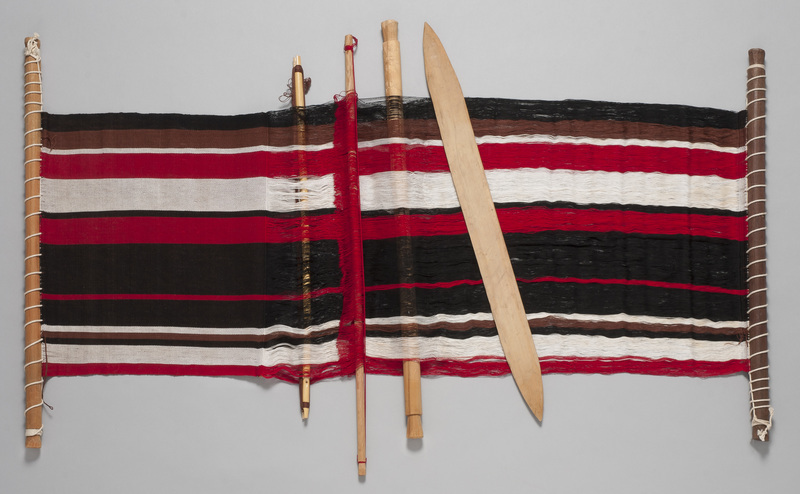 12), and women were buried with their weaving kit as these were essential to a woman’s existence from birth to death and even afterwards in the spirit realm (Sahagún 1950-82, books I:44, 6:201, 8:49) (also true in the Andes, see Capturing the Rainbow). Archaeological evidence for Classic Maya weaving activities and weaving tools is relatively scarce, although the remains of weaving activity have been found in palace contexts (e.g. at Aguateca, Guatemala; Inomata 2001) and a few tools also survive (e.g. weaving picks make of bone; Herring 1985). Moving back in time 800 years among the Maya of southern Mesoamerica, the same 16th-century inventory of five clothing types is illustrated on pictorial pottery. 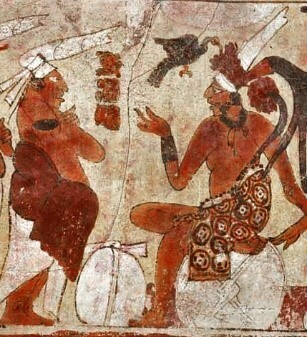 The typical male outfit is based on the simple loincloth, usually white in color although red and black cloth also was used, and some have decorated ends (fig. 13a, b). Bishop Landa makes special note of weavers’ attention to fine patterning of loincloth ends including the interweaving of colorful bird feathers (Tozzer 1941, 89). A hip cloth, of variable lengths and amount of embellishment, is wrapped over the loincloth. This second loin garment is typical of more formal attire for men and may be extensively decorated using a variety of weaving techniques (fig. 13b, c; also see fig. 2). Often the white loincloth is elegantly tied above the embellished hip cloths (fig. 13c) These two garments comprise the fundamental male attire, and may be paired with a simple head wrap of similar design (fig. 15a, b). Figure 16a. A man smokes a cigarette and stares at a jar filled with an alcoholic beverage, perhaps pulque made from fermented agave sap (the undistilled version of tequila). Museum of Fine Arts, Boston, Anonymous loan. Photo © Museum of Fine Arts, Boston. Figure 16b. A ritual performer shakes a long-handled rattle and dances on the wide stairs of a palace or other administrative building. He wears a short fringed cape while his seated companion sports a black-hued version of this performance garment. Photo © Justin Kerr, K3825. Men wear other types of garments depending on the kind of event in which they participate, the garments’ form and decoration serving to identify status and relationships among the persons in the scene. 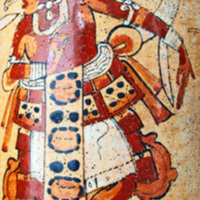 Garment color also was manipulated by Maya painters as a narrative device to lead the viewer’s eye through a cylindrical vessel’s wrap-around scene and ensure the correct interpretation of the historical message (see fig. 1). For example, this vase records a tribute presentation event between a paramount and a subordinate ruler. The two men’s nearly equal socio-political status is implied by both wearing capes. Yet the dominant ruler is discerned by his placement higher in the picture plane, and his colorful cape occupies more pictorial space. The dominant ruler’s two courtiers, too, sport ornate hip cloths whereas those of the subordinate lord are monochrome (the standing man holding a hammock litter, and the seated man behind the caped noble). Figure 16c. A seated ruler wears a distinctive red-and-pink tufted cape as he greets his victorious war captain. Photo © Justin Kerr, K3412. Figure 17a. A nobleman dances during a vision quest rite to open the portal to the spirit realm of gods and deified ancestors. Note the divination mirror behind him, supported by its rolled-up carrying cloth. Photo © Justin Kerr, K5233. Limb-encasing garments, including pants and sleeved shirts as found in the modern inventory (see figs. 5, 10), are nearly absent in both the early 16th-century and Classic period inventories. Pants and sleeved shirts primarily are a European substitute for indigenous male garments in response to Spanish standards of men’s attire, as noted above. However, sleeved and legged garments were present in ancient times. In highland Mexico among the 15th-century Aztecs limb-encasing garments were exclusive to warriors’ costumes, and are illustrated in many central Mexican manuscripts such as the Codex Mendoza (Anawalt 1982, 2011; Sahagún vol. 3, fol 65r). The same may be true for the Classic Maya portfolio of combatants’ clothing. For example, a vase from the southern Guatemalan highlands records a battle and subsequent prisoner presentation event in which the victorious warriors sport short-sleeved tops — some made from plain white cloth and others from jaguar-pelt (or jaguar-patterned cloth) (fig. 15a). 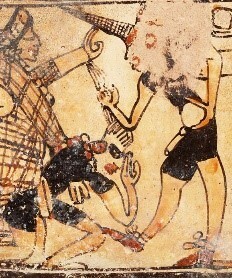 On another vase, ritual combatants dress in sleeved tops with matching black shorts (fig. 15b; compare with the modern version in fig. 5). Men occasionally wear short or long capes depending on role, status, and the nature of the event. Mid-length and long capes usually identify nobles attending palace events whereas more elaborate ones are reserved for rulers and special officials or participants playing principal roles in certain ceremonial events (see figs. 2, 16). Figure 18a. A courtesan wears an elegant short blouse wrapped over her breasts and a long wrap skirt in contrasting colors and designs. Photo © Justin Kerr, K544. Figure 18b. Two royal women are dressed in typical courtly attire, including a two-piece outfit of long tunic over a wrap skirt and a long wrap dress covering the breasts. Note the lively patterning typical of high status clothing. Museum of Fine Arts, Boston, Gift of Landon T. Clay, 1988.1176. Photo © Museum of Fine Arts, Boston. Figure 17b. A noble assumes the guise of a mythical shrimp-centipede-jaguar spirit during a ritual performance. Princeton Art Museum, y1988-22. Photo © Justin Kerr, K533. Figure 18c. 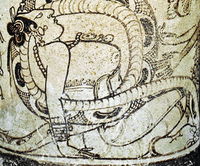 A mythical scene features a woman entwined in the coils of a boa constrictor from which emerges an aged deity. She wears a tunic dress wrapped underneath her ample breasts. Photo © Justin Kerr, K5164. For example, participants in vision quest rites frequently tie a short plain cape across one shoulder and draped over the chest (fig. 16a). Elaborate shoulder capes are worn by performers and participants in rites taking place in more open settings such as the wide staircases fronting palaces and administrative buildings (fig. 16b). And a distinctive pink-and-white tufted cape is reserved for those receiving war bounty (fig. 16c). This singular cape may have been decorated with rows of feathers based on observations by Spanish friars concerning feathered garments being reserved for warriors (Anawalt 1981, 10, 37-29; Tozzer 1941, 201; also see Culbert 1993, fig. 72; Ceibal Stela 10 depicts a carved representation of this war-related cape). Kneeling in front of the caped lord is a battle leader wearing a protective tunic made from plaited fibers such as agave or xate (Chamaedorea ernesti-augusti), a durable palm frond. Alternatively, this armor-tunic may have been made of two layers of quilted cotton like those described by 16th-century witnesses in Yucatan and central Mexico (Tozzer 1941, 35, 121; Codex Mendoza vol. 3, fols. 64r, 65r, 66r [see Berdan and Anawalt 1997]). The painted pictorial record reserves the most elaborate male costuming for performers in public and sequestered ritual pageants, most of which transpired during important social and political rites (e.g. Miller and Brittenham 2002, 129-137) (fig. 17a,b). The painted renderings display a vast array of decorated loin and hip cloths, waist bands, shoulder and long capes, backrack assemblages, headdresses, and full-head masks. Many performance costumes portray supernatural beings, each unique ensemble serving to transform the social person into a mystical form as an expression of his spiritual power and authority (fig. 17b). Figure 19a. The mother of the so-called “baby jaguar deity” holds a cloth bundle likely containing sacred implements pertaining to this enigmatic being. She wears a long black huipíl decorated with clusters of white petal- or shell-like circles. Museum of Fine Arts, Boston, Gift of Landon T. Clay, 1988.1184. Photo © Museum of Fine Arts, Boston. Figure 19b. A vase is decorated with the distinctive cloth motif associated with female deities. Mint Museum of Art, Gift of Francis Robicsek, 1986.3.1. Mint Museum of Art, Gift of Francis Robicsek, 1986.3.1. Photo by D. Reents-Budet. Figure 19c. A woman about to give birth wears a long wrap tunic bound underneath her breasts. Photo by D. Reents-Budet. Figure 19d. A vase is adorned with the same fabric design that identifies the Moon Goddess. Mint Museum of Art, Gift of Francis Robiscek, 1982.208.2. Photo by D. Reents-Budet. Figure 19e. The Old Moon Goddess in her role as midwife attends a birthing event. Photo by D. Reents-Budet. Figure 20a. One of two singing/dancing women from a narrative grouping of 23 figurines found in the tomb of a ruler at Waká-El Perú, Guatemala. They portray the burial/resurrection ceremony for a deceased king, and this figurine wears the ritual black dress of women in pivotal roles during sacred rites. Photo by Michelle Rich, courtesy Waká Archaeological Project (dir: David Freidel). Figure 20b. A court matron is attired in the formal black huipíl while she assists in a ritual boxing-vision quest-blood sacrifice sacrament. Museum of Fine Arts, Boston, Gift of Landon T. Clay, 1988.1274. Photo © Museum of Fine Arts, Boston. Classic Maya women typically wear a wrap skirt and blouse or a long wrap tunic (fig. 18a-c). The blouse may be short and wrapped over the breasts and underneath the arms (fig. 18a) or it may be a longer tunic-like blouse with arm slits at the sides (fig. 18b; compare with the modern versions in figs. 6, 9). The long wrapped dress may be worn covering the breasts (fig. 18b) or baring them (fig. 19c), the latter fashion being common in the tropical lowland regions according to early Colonial documents. The custom of leaving the breasts uncovered became less frequent in later Colonial times in accordance with Spanish and Catholic tenets of female modesty (also true of the Guna of Panamá, see Engaging the New). As with male garments, women’s dress can identify one’s role in and nature of the illustrated event. 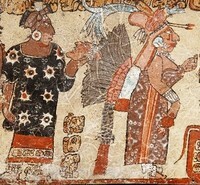 One example is the Maya version of the “little black dress,” a long black huipíl decorated with one of two motifs: a white cluster of three or five petal-like circles (fig. 19a, b) or a white circle with crenelated edge (fig. 19c, d) (Reents-Budet 2007, 114). This distinctive huipíl is worn by the mother of the so-called “baby jaguar deity” (fig. 19a) and the moon goddess in her two aspects as an old midwife (fig. 19e) and the youthful new moon (see 1988.1282, MFA Collections). Elite Maya women wear this special black patterned garment during courtly proceedings, especially those associated with change of office and life-transition rites (fig. 20a). The dress, too, was worn by royal women attending to vital duties during obligatory rites concerning the sacred foundation of political authority, in particular ones of ritual intoxication, bloodletting, and vision quest (Schele and Miller 1986, 175-208) (fig. 20b). Textiles served not only to envelop the human body but also to protect or contain the potent powers of sacred objects. Foremost among these are divination mirrors, which were considered portals to the spirit world. When in use, they usually are rendered with their protective cloth wrappings serving as a support (fig. 21). In addition to the potent mirrors, the practice of “dressing” sacred objects in fine textiles is well-documented by the archaeological excavation of ritual objects encrusted with textile remains or pseudomorphs (the mineralogical replacement of organic fibers) (fig. 3b). Pseudomorphs are especially prevalent on pottery and, in the Andean region, on metal objects due to their natural degradation processes or “rusting” (see The Threads of Time Conservation Project). The ubiquity of this practice is further attested by the thin layers of fine reddish powder often found in Maya tombs and caches and underneath the funerary offerings. This powder is all that remains of the objects’ textile wrappings (e.g. see Carrasco 1996). Figure 21. A noble, likely a ruler, gazes into a divination mirror which is propped up by the red cloth in which it is wrapped when not in use. On loan to the Michael C. Carlos Museum, L2003.14.57 (K7797). Photo by Bruce M. White, 2011. 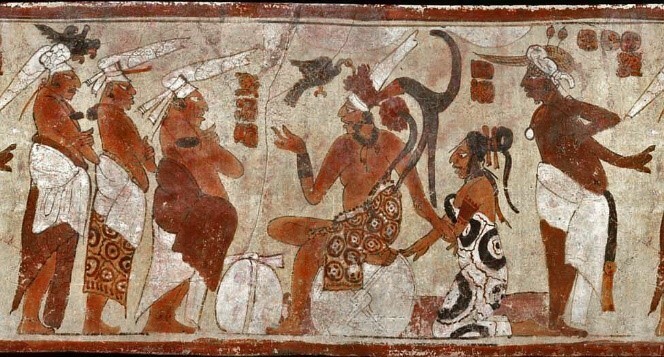 The importance of cloth among the Classic Maya is illustrated by the many representations of fabric as tax payments and diplomatic gifts (fig. 22a), as war tribute paid to overlords (fig. 22b, d), and especially as feasting gifts bestowed by hosts to boost prestige (fig. 22c) (Reents-Budet 2000). Bishop Landa discusses these same functions for cloth, emphasizing its being the most valued gift distributed during feasts (Tozzer 1941, 258, 304). In fact, throughout Mesoamerica cloth was ranked alongside precious cacao in terms of value and esteem (Brumfiel 1978, 1997; Burgoa 1989, Herrera 1945, Hicks 1994, Houston 1997). 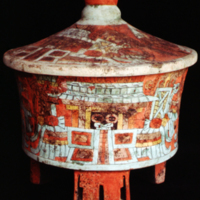 Classic Maya painted images of stacks of tribute and gifts may include quetzal feathers, shells, jadeite adornments and/or prepared foods (fig. 22d). Yet by far, cloth is the most prevalent commodity and often serves pars pro toto for the tribute or gift (Reents-Budet 2007:110-111). Figure 22a. Gifts presented as part of a diplomatic meeting between political adversaries include a bundle of cacao beans, a sheath of quetzal features, and a large stack of folded mantles. Museum of Fine Arts, Boston, Gift of Landon T. Clay, 2004.2204. Photo © Museum of Fine Arts, Boston. Figure 22b. War tribute presented to the enthroned victor features the captured war captain and two sumptuous piles of highly decorated fabric. Museum of Fine Arts, Boston, Gift of Landon T. Clay, 1988.1170. Photo © Museum of Fine Arts, Boston. Figure 22c.. The rendering of a courtly feast is predominated by the cloth gifts arrayed on the broad stairs leading up to the host seated on a masonry bench. Gardiner Museum of Ceramic Art, G83.1.129. Photo © Justin Kerr, K6059. Figure 22d. Piles of tribute are set before a seated ruler. The tribute includes a basket filled with small round items, large Spondylus shells, quetzal feathers, and folds of white and red cloth. Note the attendant kneeling behind the ruler who prominently displays a long swatch of finished textile. Photo © Justin Kerr, K1392. The vases in b. and d. were painted in closely aligned workshops if not by the same artist. Figure 23. A large cloth-wrapped bundle sits between men representing the two families of a prospective nuptial couple. The giving of gifts to the prospective bride’s father, including chocolate and clothing, continues today throughout Mexico and Guatemala among many indigenous groups. On loan to the Michael C. Carlos Museum, L2003.14.58. Photo by Bruce M. White, 2011. A plethora of fabric decorative styles and techniques is represented on the Classic period painted pottery. Yet to date, efforts to correlate a specific clothing type with the geographic location of the historical scene and/or the pottery vessel’s workshop have been unsuccessful. This is surprising given the strong correspondence today between Maya groups’ individualistic clothing styles and place of origin or habitation. Perhaps the lack of a Classic period parallel is due to a stronger link between the nature of the event and its appropriate clothing communicating one’s place therein. In other words, Classic-period socio-political conventions may have overridden any kind of geo-political messaging for the clothing. Instead, the social or political role of the wearer determined the type of garment worn, its design motifs, and even the fabric’s fiber content and overall quality. Therefore, on the painted ceramics clothing type and style aids the viewer in correctly interpreting the pictorial narrative and identifying the roles of the participants. 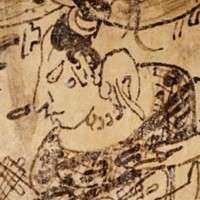 Viewed from this perspective, the use of clothing among today’s Mayas as a socio-political graphic idiom reaches back more than 1200 years to the Classic period. Figure 24a. The imagery adorning this vase replicates a multi-layered textile, the herringbone design of the underlying fabric suggesting a twill fabric overlaid by an openwork layer. Denver Art Museum, 5.1980. Photo by D. Reents-Budet (also K5179). Figure 24b-c. The pseudomorph on the lid of this tripod vessel suggests either a plain weave or a twill fabric. Margarita Tomb, Copán. Photo by D. Reents-Budet. Figure 24c. Photo by D. Reents-Budet. 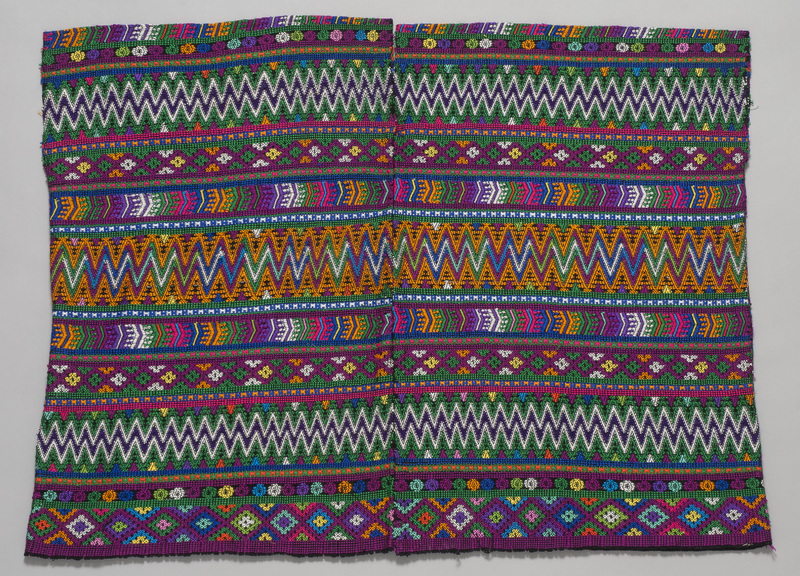 The wide variety of textile depictions provides an avenue for postulating the array of weaving and decorative techniques mastered by Maya fiber artists. 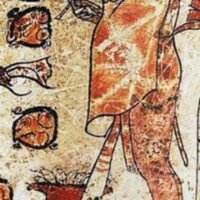 It is important to acknowledge these representations as stylized portrayals rather than methodological depictions, and that the painters likely were not striving to accurately render weaving techniques. Thus caution is needed in any attempt to identify specific weaving and decorative methods in these painted illustrations of cloth. Yet the variety of textile illustrations on the painted pottery provides an avenue to explore Classic period weaving techniques in the absence of surviving fabrics. The most common depictions appear to be plain weaves and twills, (fig. 24a) which also comprise the majority of pseudomorphs on pottery vessels found in tombs. These fossilized remains indicate that stacks of cloth constituted a sizable portion of the funerary goods and also that some tomb offerings had been wrapped in (fig. 24b). One of the more common weaving techniques may be supplementary weft decoration (brocading), which often appears on the long huipíles worn by ladies in formal palace settings and by mythic women (i.e., deities and other supernatural persons) (figs. 25a, b). These conjectured representations of the brocade technique often feature a gauze-like fabric ornamented with dense geometric designs suggesting the characteristic interwoven threads of a brocaded fabric. Figure 25a. A royal woman of Tikal (Guatemala) kneels in a dynamic pose. She is clothed in a long red huipíl with what may be a discontinuous warp-and-weft hem, the huipíl wrapped below her breasts. Over the huipíl she wears a luxurious open-weave overblouse with brocade-like geometric motifs. Photo © Justin Kerr, K2573. 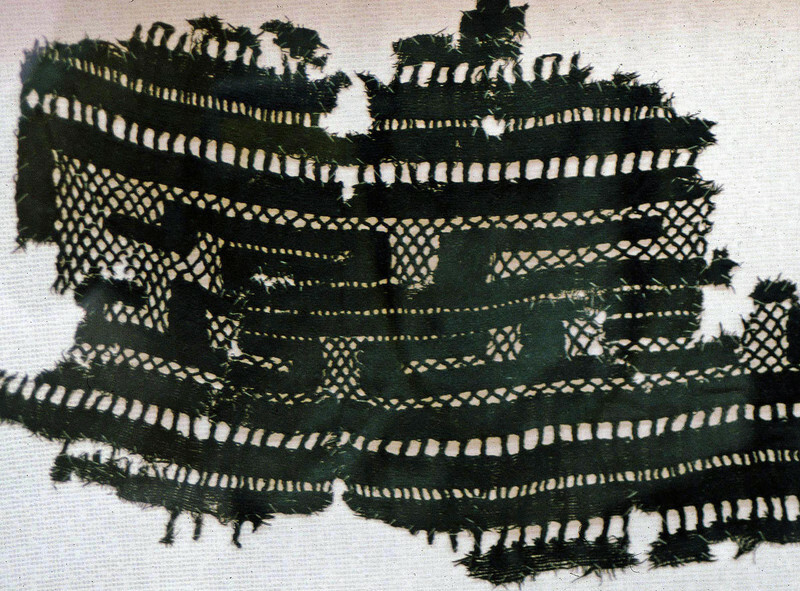 A thin and delicate gauze weave was favored for other huipíles worn by elite women taking part in ritual performances (fig. 26a). 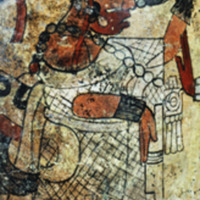 The presence of gauze weaves during the Classic period is occasionally preserved in pseudomorphs on the exteriors of funerary vessels such as a stuccoed-and-painted bowl found in the tomb of a royal Copán (Honduras) woman who perhaps was the wife of the dynastic founder Yax K’uk’ Mo’ (fig. 26b) (Bell at al. 2004, 138). 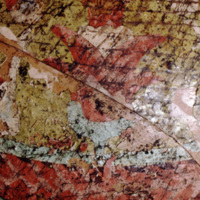 Sheer cotton fabrics also are pictured on the pottery and in the recently-discovered wall murals at Calakmul, Mexico (Martin 2012). Based on these renderings, perhaps this diaphanous fabric was more commonly worn by younger women — both human and divine (fig. 26c). Many textile representations imply a combination of weaving techniques, especially fabrics presented as tribute payments and gifts (figs. 27a, b). These include fanciful hems produced using a discontinuous warp-and-weft technique as well as double-cloth and intricate embroidery. Elite clothing sometimes was boldly patterned, and those featuring curvilinear designs may portray painted fabrics (fig. 28a). The hems of many garments are ornamented with bands of complex designs, which may depict weaving, painting, or embroidery (fig. 28b). Edgework included fringe and perhaps interwoven feathers (figs. 27b, 28c). It is likely that some of the decorative motifs were not made from fibers but instead represent attached elements such as tiny shell squares or beads of greenstone or shell. Hundreds of tiny beads and perforated shell or greenstone tesserae have been found in tombs concentrated around the skeletal remains, their arrangement evincing an adorned garment. Rulers and other nobles wore sumptuous garments at court especially during important social and political gatherings. In addition to the most common types of weaves and decoration, more complex modes of fabrication are intimated by these extravagant textile depictions. One such method is tie-dyeing, which typically produces white-bordered shapes with blurred edges and interspersed coloration (fig. 29a). A related technique is jaspé which uses tie-dyed yarns to weave the fabric. The technique creates a geometric, soft-edged design, capable of evoking rounded contours. 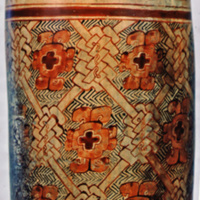 Jaspé is commonly used by modern Maya weavers, and it may be present in the Classic period pictorial record, too (figs. 29b, c; compare with 2009.42.175). Figure 25b. A similar, perhaps brocade, overblouse with geometric forms often clothes supernatural women in mythic narratives. Museum of Fine Arts, Boston, 1988.1180, Gift of Landon T. Clay. Photo © Museum of Fine Arts, Boston. Figure 26a. A noble woman dances while she assists a lord undergoing a vision quest performance. She wears a long, sheer overblouse or huipíl atop a wrap skirt. Photo by D. Reents-Budet. Figure 26b. 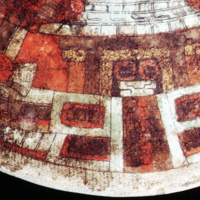 A gauze fabric is preserved as a pseudomorph on a stuccoed-and-painted bowl from the Margarita Tomb, Copán, Honduras. Photo by D. Reents-Budet. Figure 26c. 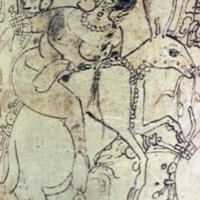 In a mythic scene, a voluptuous young woman rides a deer which actually is the transformed Maize god. Her sheer fabric huipíl shows off her feminine beauty. Museum of Fine Arts, Boston, Gift of Landon T. Clay, 1988.1180. Photo © Museum of Fine Arts, Boston. The identification of specific decorative techniques with representations on pottery deserves more study given the variety and complexity of these painted interpretations that match those seen in modern-day indigenous fabrics from Guatemala and Mexico. Also deserving of investigation is the diversity of Classic period head wraps and headdresses that, like the garments, comprise a visual symbolic system of identity and meaning. As noted previously, a person’s garment and headgear often are similarly decorated, implying a pairing germane to social position and courtly role as well as the nature of the event (e.g., see Coe and Kerr 1989). Figure 28a. The exuberant, curvilinear shapes on many fabrics may render painted rather than woven decoration. On loan to the Michael C. Carlos Museum, L2003.14.58. Photo by Bruce M. White, 2011. Figure 28b. Hem lines often are highly ornamented, sometimes even with hieroglyphic texts as seen on the bottom edge of a woman’s wrap skirt. Museum of Fine Arts, Boston, Gift of Landon T. Clay, 1988.1176. Photo © Museum of Fine Arts, Boston. Figure 28c. The standard male loincloth was as lavishly embellished as were women’s garments. The complex yet delicate garnish of this loincloth may depict an embroidered fabric. Note the tiny hieroglyphs on the loincloth’s upper tie end and the lattice-and-tassels at both ends composed of tied warp threads. Museum of Fine Arts, Boston, Gift of Landon T. Clay, 2004.2204. Photo © Museum of Fine Arts, Boston. Figure 29a. Tie-dyeing may be indicated by soft-edged, multi-colored designs outlined in white (the color of the base cloth). Museum of Fine Arts, Boston, Gift of Landon T. Clay, 1988.1176. Photo © Museum of Fine Arts, Boston. b. The designs on the hipcloths worn by a supernatural artist may have been produced using the jaspé technique. Museum of Fine Arts, Boston, Anonymous loan. Courtesy Museum of Fine Arts, Boston. Figure 29c. The designs on the hipcloths worn by a courtier may have been produced using the jaspé technique. Museum of Fine Arts, Boston, Loan of Landon T. Clay. Courtesy Museum of Fine Arts, Boston. This essay is dedicated to Donna Horié, Barbara Kerr, and Landon T. Clay–mentors, good friends and scholars who taught me about ancient Americas textiles and opened my eyes to the wealth of fiber arts data portrayed on Classic Maya pictorial pottery.